Our itinerary was to include several of the Western islands - Arran, Mull, the Uists and Benbecula, Harris, and finally the Isle of Skye. Most of these islands are of course noteworthy for one important fact - no railways! Mull however is no longer in the latter category, for in 1983 it became the only Scottish island ever to have a passenger railway service*. Clearly, Mull HAD to be on the route! We sailed to Craignure pier, Mull from Oban, on the MV Caledonia. Torosay Castle, a stately home opened to the public in 1975, is about a mile from Craignure. The railway plies between these two points, partly in forest and partly in the open, and as the ferry neared Craignure we caught our first sight of a plume of steam and a rake of coaches moving steadily along the latter stretch. (Self) "Oh Look. There seems to be a railway or something here." (Offspring) "Can we go for a ride Dad?" The ferry fare of over £16 return for the car means that most day visitors from Oban to Mull travel as foot passengers. It was partly to attract the latter that Torosay was opened to the public, but the distance on foot from Craignure put most people off, giving the stimulus for the railway. The decision to form the "Mull and West Highland Narrow Gauge Railway Company Limited" was taken in 1975, with planning consent being received later the same year. However some local objections and other problems remained, and it was not until late 1980 that the first volunteer working party ventured forth, with real momentum being gained in April 1982, having obtained financial support from the Highlands and Islands Development Board. 22nd May 1983 was a red letter day, when "Lady of the Isles" was steamed for the first time on the island and ran the length of the line on clearance tests. An experimental daily passenger service began in August that year, and the railway was officially opened on 22nd June 1984 by Chris Green, General Manager of Scotrail. The railway is somewhat smaller than might have been imagined so far, having been laid to a mere 10¼" gauge. The concept is however definitely "Narrow Gauge" rather than "Miniature". It has transportation, rather than amusement, as its "raison d'etre", covered coaches, and narrow gauge type locomotives, which are as a result much larger than model standard gauge locos would be. The train we saw from the ferry was in fact the last of the day; the following day we toured and explored the island. We had therefore a brief morning to spare before catching our ferry back to Oban, and decided on the first train of the day. 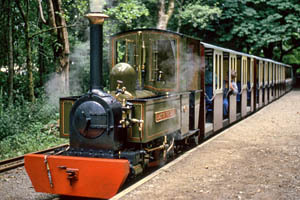 This originates at Torosay, where the station is located deep in the woods, about 400 yards from the Castle. As we arrived, a train of empty stock was leaving to form the first train from Craignure, headed by diesel hydraulic "Glen Auldyn". Moments later our train backed into the platform, a column of steam rising into the morning air. With a few minutes before departure time, I strolled to the front to have a look at the engine and a chat with the driver. "Lady of the Isles" is a most attractive 2-6-4T, outside framed, bearing a livery based apparently on the North British Railway and the Campbeltown & Macrihanish Railway. Built in 1981 by Roger Marsh Ltd. of Hinkley, it shows a clear link with earlier minimum gauge railways, in that the valves are operated by Heywood valve gear, as used on Sir Arthur's notable locomotives at Duffield Bank and Eaton Park. Most passengers join the train at Craignure for their return journey, so we had the train to ourselves as we pulled away from Torosay. The line rises at first, falls to Skeleton Gulch, then climbs steadily to the summit of the line ("Beattock"), still in the woods, with miniature gradient posts confirming the engine's hard work. It then drops steeply, with a short stretch at 1 in 52. Once out of the woods, the course is fairly level. The only passing loop, at Tarmstedt, is encountered more than two thirds of the way along the line. Watering facilities here were not needed on this occasion. The name commemorates the breakout from a German POW camp by the Chairman of the company and resident of Torosay Castle, David Guthrie James. His successful escape began at the narrow gauge railway station at Tarmstedt, a small town near the Baltic Sea. Next major (!) landmark is Bob's Big Ditch, marking the end of a rather boggy stretch, before arriving at Craignure, where a rather attractive wooden station building has been erected, with ticket office and railway bookshop. There being no ticket office at Torosay, we paid here before joining the train for our return journey, which was to be formed of the stock we had seen earlier, and headed by the diesel "Glen Auldyn". "Lady of the Isles" in the meantime had turned on the turntable - there is one at each end of the line - and awaited our departure before she could run round her train. With a good complement of passengers, our diesel pulled away and we re-traced our earlier steps, an added bonus being a photo-stop at Tarmstedt. It would have been a water stop, had we still been steam hauled. Finally we arrived back at Torosay, to say our farewells to Mull Rail, and headed for the ferry to take our leave of Mull too. Conclusions? - highly recommended to anyone holidaying in the Oban area. The crossing from Oban to Mull is a pleasant one, with some fine scenery on the way, and with a visit to the castle as well, could make an excellent day out. *Bute once had an electric tramway, from Rothesay to Ettrick bay, and other islands (e.g. Skye, Raasay, Lewis) had industrial railways of one kind or another.